Don't you just love a blog sale?! When I spotted the MAC Nylon Eyeshadow in one back in February, I knew it was the perfect shade to complete my MAC eyeshadow quad. Coincidentally I had my makeup done by a MUA on my hen do the week before and Nylon had gone straight on my wishlist after she used it on the inner corner of my eyes and on my brow bones. Nylon has a frost finish and is described by MAC as a "pale gold with icy shimmer", which as mentioned before makes it the perfect highlighting shade for the eyes. I completely agree with MAC on this; both the gold and the shimmer are very subtle; the shimmer makes the shadow look almost white, but the warm tone of the gold still comes through. Nylon is extremely pigmented; you only need the smallest amount to brighten your eyes and I'm so impressed that it stays put around my tear duct all day. 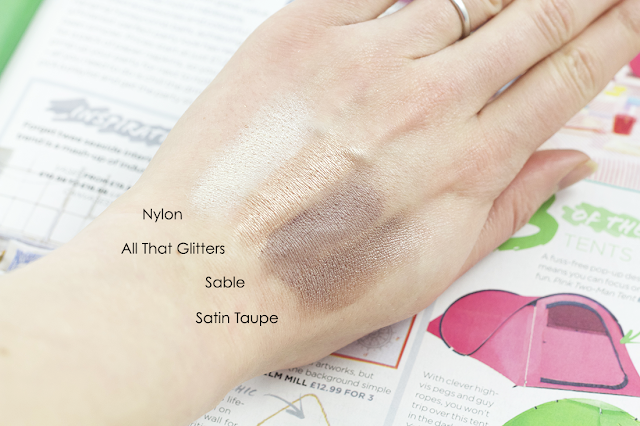 Sitting with Nylon in my MAC eyeshadow quad is All That Glitters (soft beige with gold pearl), Sable (gold-plum with bronze pearl) and Satin Taupe (taupe with silver shimmer). What I love about all of these shades is that they're super pigmented, have a smooth, buttery formula with barely any fall out and can be easily built up to the desired level of intensity. Yes £10.00 is steep for an eyeshadow pan (or £13.00 for one in its own case), but I do honestly think this is one high end product worth paying for. Which MAC eyeshadow shades do you love? Great colour picks! I've gotten L Satin Taupe as a present before think I need to get round to getting it myself! I love quarry at the moment! 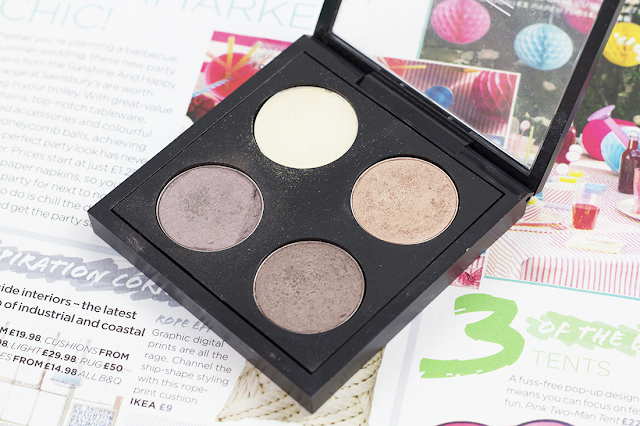 I've just got the cool neutrals palette and loving lots of shades in there too. If you're open to colours it's a great way to get neutrals as it's only £65 for 15 shades :). Love the colours! Soooo pretty & girly.